Design simplicity and dependabiltiy have made Fulghum's vibrating conveyors a most versatile piece of equipment. A vibrating conveyor installed under a drum debarker can transport bark and other wood residues to loadout. 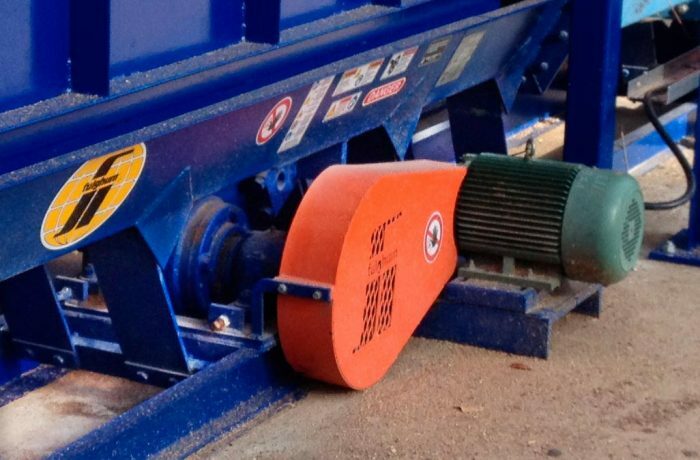 In other applications, the vibrating conveyor feeds trim block, edgings and slabs to wood chippers. The vibrating conveyor is manufactured in four sizes. Movement is by an eccentric drive with spherical roller bearings on the eccentric shaft. The drive and flat springs are tuned so that the natural frequency of the conveyor is established.